Paraneoplastic and autoimmune retinopathies belong to a spectrum of uncommon ophthalmic disorders in which autoantibodies directed at various retinal proteins cause progressive vision loss. [1, 2] Paraneoplastic retinopathies (PR) are characterized by retinal antibodies in the setting of an underlying malignancy, whereas autoimmune retinopathies (AR) are characterized by autoantibodies directed against retinal proteins without a known malignancy. The onset of visual symptoms and detection of antibodies may precede the diagnosis of malignancy by months to years, the longest reported interval being 11 years. In some cases, patients with an underlying malignancy have been found to have high titers of antiretinal antibodies but no evidence of visual loss. Findings on retinal examination are usually normal early in the course of the disease, posing a diagnostic challenge in some cases. Markedly abnormal electroretinographic (ERG) findings indicate the correct diagnosis, which can usually be confirmed with immunofluorescence techniques to identify circulating retinal antibodies. Symptoms and signs depend on which retinal elements are affected. CAR affects both rods and cones, whereas MAR is typically characterized by antibodies directed toward bipolar cells that interfere with rod function. Patients with cone-associated retinopathy have dysfunction limited to only cones. Individuals with cone dysfunction experience photosensitivity, prolonged glare after light exposure (hemeralopia), reduced visual acuity and central vision, and loss of color vision. Individuals with rod dysfunction have difficulty seeing in dim illumination (nyctalopia), prolonged dark adaptation, and peripheral field loss. In either case, positive visual phenomena are prominent, including flashing lights (photopsia), flickering, smoky or swirling vision, and other entoptic symptoms. Some patients report transient dimming of vision, which may be mistaken for retinovascular disease. Occasional cases with overlap features occur. On examination, patients with CAR usually have prominent involvement of central vision, resulting in markedly decreased visual acuity, loss of color vision, and central scotomas. In some cases, visual-field testing shows paracentral scotomas that progress to classic ring scotomas. Photostress recovery times are typically prolonged. In contrast, patients with MAR often have near-normal visual acuity, color vision, and central visual fields early in their course. For example, in the series by Keltner et al, visual acuity was 20/60 or better in 82% at presentation but in only 30% at last follow-up. However, most patients with MAR experience progressive visual loss, especially in the peripheral visual field. Fluorescein angiography is often performed to exclude other entities as potential causes of vision loss. Findings are usually normal, but in occasional cases, there is mild peripheral vascular leakage consistent with vasculitis. Thinning of the inner retinal layers has been demonstrated with optical coherence tomography (OCT) in CAR  and in AR  . The findings from full-field (Ganzfeld) ERG are almost always abnormal. Specific findings depend on the predominance of cone versus rod dysfunction. Patients with CAR usually have absent cone responses with reduced a and b waves in both photopic and scotopic conditions. Findings in MAR include a markedly reduced or absent dark-adapted b wave (electronegative waveform), which indicates bipolar and Müller cell dysfunction with preserved photoreceptor function. Multifocal ERG (MERG) is useful for evaluating select cases in which visual-field loss is localized, for monitoring disease progression, and for correlating with visual-field loss. It is important to maintain a high index of suspicion for a PR or AR in patients who present with newly onset progressive vision loss in the setting of a normal-appearing fundus on examination. The initial workup should include a full assessment of the patient's visual function, including color vision and visual field testing. Goldmann perimetry is preferred because it readily tests the peripheral field and because kinetic perimetry may be more sensitive than static for detecting changes in this disorder. If automated perimetry is performed, the test should be adapted to include the peripheral field. Full-field ERG is crucial for localizing the disease process to the retina and for further defining the retinal elements involved. In select cases, MERG may be helpful. In any patient with suspected CAR and without a known malignancy, a chest radiograph should be obtained. If the result is normal and the index of suspicion of CAR remains high, a chest CT scanning is appropriate. Additional imaging studies to consider include CT of the abdomen and pelvis, mammography (in women), and total-body positron-emission tomography (PET) or CT/PET. Complete physical examination, including pelvic and breast examinations for women, is also recommended. Acute or subacute unilateral or bilateral vision loss with a normal-appearing fundus suggests the possibility of retrobulbar optic neuropathy. Specific entities to consider include compressive orbital and intracranial lesions, demyelinating disease, ischemia, toxicity, and hereditary disorders. In the ideal case, the clinical findings are sufficiently distinct to distinguish optic nerve disease from retinal disease and therefore obviate extensive neurologic testing. Symptoms of hemeralopia or nyctalopia (degradation of vision in bright or dim lighting, respectively), positive visual phenomena, prolonged photostress times (as determined from the history or examination), and ring scotomas indicate retinal disease, even in the absence of funduscopic abnormalities, and should prompt electrophysiologic studies. If the ERG findings clearly confirm a retinal disorder, additional neurodiagnostic testing is unnecessary. Patients with cancer-associated cone dysfunction have bilateral central vision loss with poor color vision and central scotomas. These findings are also compatible with toxic-nutritional optic neuropathy or hereditary optic neuropathy. Patients with these findings should be questioned about tobacco and alcohol use, dietary habits, exposure to environmental toxins, use of potentially toxic medications, and a family history of similar problems. MERG should be effective for distinguishing optic neuropathy from maculopathy in these patients. In patients with unexplained vision loss and a history of malignancy, the differential diagnosis may be complex. Workup for metastatic disease as the cause of the vision loss should include contrast-enhanced MRI of the head and orbits and lumbar puncture for cytologic examination. Some chemotherapeutic agents, such as vincristine and carmustine (BCNU), can cause optic neuropathy. Patients who have received cranial radiation are also at risk for vision loss, which is usually identifiable on MRI. Vision loss in patients with metastatic disease may be due to infiltration of malignant cells around the optic nerve. Diffuse melanocytic proliferation is a possibility in cancers originating from the reproductive tract, retroperitoneal zone, or lungs. For reasons that are poorly understood, patients with this proliferation develop an orange pigment deposit at the level of the RPE; fluorescein angiography shows hyperfluorescence. Once it is clear that the patient's vision loss is due to photoreceptor dysfunction, the differential diagnosis is narrowed to paraneoplastic syndromes, hereditary photoreceptor degeneration (eg, cone dystrophy, retinitis pigmentosa), and toxic retinopathy. The time course in patients with hereditary retinopathies is generally longer than that of patients with acquired disease; progression occurs over years rather than weeks to months. Patients should be questioned regarding the use of potential retinal toxins, such as chloroquine, hydroxychloroquine, and thioridazine. The clinical findings of acute zonal occult outer retinopathy (AZOOR) occasionally overlap with PR/AR, sometimes causing diagnostic confusion. In AZOOR, the nonseeing areas are more sharply demarcated from the surrounding areas, the involvement is usually unilateral, and the disease has a predilection for the peripapillary area. Although MERG demonstrates the abnormality well, findings from full-field ERG are generally normal, in distinction from PR in which ERG findings are markedly attenuated or flat early in the course of disease. Patients with MAR have IgG autoantibodies directed against rod bipolar cells, a 22-kd neuronal antigen  and transducin  . These same antibodies were identified in a patient with colon cancer; therefore, this finding is not specific. Antibodies directed against the 35-kd retinal Müller-cell layer have been found in some patients with AR (eg, those without evidence of underlying malignancy). Postmortem examination of eyes with CAR demonstrates diffuse photoreceptor degeneration with or without inflammation. Ganglion cells and retinal vasculature are spared. In MAR, bipolar neurons in the inner nuclear layer are markedly decreased, with evidence of transsynaptic ganglion-cell atrophy. A study of 30 patients with PR or AR found improvement in 21 (70%) using immunosuppressive agents. In this report, the best response occurred in those with cancer-associated disease (improvement in 6 of 6 cases). Various agents were used, including corticosteroids (periocular and systemic), azathioprine, intravenous immunoglobulin, mycophenolate mofetil, cyclosporine, infliximab, and various combinations of these immunomodulatory medications. A 60-year-old plumber developed painless visual loss in the right eye accompanied by intermittent "swirling clouds of smoke", occasional dim flashes of light, and photophobia. 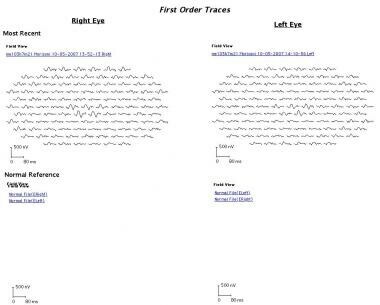 Visual acuity was count fingers in the right eye and 20/25 in the left eye. The visual field in the right eye showed a ring scotoma and was normal in the left eye. Dilated funduscopic examination and fluorescein angiography were normal. A retrobulbar optic neuropathy was suspected, but an MRI of the brain and orbits with gadolinium was normal. He received a tentative diagnosis of posterior ischemic optic neuropathy. Two months later, similar though milder visual loss developed in the left eye (see the image below). As before, the fundus appearance was normal. Goldmann perimetry in the above patient with bilateral sequential visual loss and photopsias. In the right eye, there is a dense ring scotoma breaking out to the periphery. In the left eye, there is an inferior arcuate scotoma that breaks out nasally. A full-field ERG was nearly unrecordable under both scotopic and photopic conditions, indicating severe dysfunction of both rods and cones. Serologic testing showed antibodies to recoverin, diagnostic of cancer-associated retinopathy (CAR). A chest radiograph was normal, but CT of the chest revealed a small lesion, which, on biopsy, proved to be a small-cell lung carcinoma. His primary tumor was treated with radiation and chemotherapy, and he received a course of high-dose intravenous corticosteroids followed by rituximab. Vision stabilized but unfortunately showed minimal improvement. A 65-year-old dental hygienist presented with a 3-year history of flashing, squiggly lines around the periphery of her vision in both eyes, initially intermittent but more persistent over time. 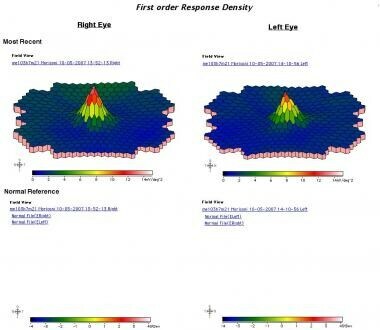 Visual acuity, color vision, and pupillary responses were normal. Goldmann perimetry (shown in the image below) showed several scotomas between 10 and 20 degrees in each eye, almost coalescing to form a ring scotoma. Fundus appearance and fluorescein angiography were normal. Goldmann perimetry in the above patient shows several scotomas between 10 and 20 degrees in each eye, almost coalescing to form a ring scotoma. While a normal foveal peak is noted, there is marked generalized decrease in the perifoveal responses in each eye. Multifocal ERG (images below) showed decreased amplitude surrounding fixation, corresponding to the location of the scotomas. Her serum was negative for anti-recoverin antibodies but positive for antibodies to 30 kd (carbonic anhydrase II). In addition, immunohistochemistry showed staining of some cells in the bipolar cell layer. She received a diagnosis of autoimmune retinopathy and has been followed conservatively. Adamus G. Autoantibody targets and their cancer relationship in the pathogenicity of paraneoplastic retinopathy. Autoimmun Rev. 2009 Mar. 8(5):410-4. [Medline]. Mizener JB, Kimura AE, Adamus G, Thirkill CE, Goeken JA, Kardon RH. Autoimmune retinopathy in the absence of cancer. AM J Ohpthalmol. 1996. 123:607-618. Saito W, Kase S, Ohguro H, Furudate N, Ohno S. Slowly progressive cancer-associated retinopathy. Arch Ophthalmol. 2007 Oct. 125(10):1431-3. [Medline]. Sawyer RA, Selhorst JB, Zimmerman LE, Hoyt WF. Blindness caused by photoreceptor degeneration as a remote effect of cancer. Am J Ophthalmol. 1976 May. 81(5):606-13. [Medline]. Thirkill CE, Roth AM, Keltner JL. Cancer-associated retinopathy. Arch Ophthalmol. 1987 Mar. 105(3):372-5. [Medline]. Berson EL, Lessell S. Paraneoplastic night blindness with malignant melanoma. Am J Ophthalmol. 1988 Sep 15. 106(3):307-11. [Medline]. Weleber RG, Watzke RC, Shults WT, Trzupek KM, Heckenlively JR, Egan RA. Clinical and electrophysiologic characterization of paraneoplastic and autoimmune retinopathies associated with antienolase antibodies. Am J Ophthalmol. 2005 May. 139(5):780-94. [Medline]. Adamus G, Karren L. Autoimmunity against carbonic anhydrase II affects retinal cell functions in autoimmune retinopathy. J Autoimmun. 2009 Mar. 32(2):133-9. [Medline]. Keltner JL, Thirkill CE, Yip PT. Clinical and immunologic characteristics of melanoma-associated retinopathy syndrome: eleven new cases and a review of 51 previously published cases. J Neuroophthalmol. 2001 Sep. 21(3):173-87. [Medline]. Jacobson DM, Thirkill CE. Paraneoplastic cone dysfunction: an unusual visual remote effect of cancer. Arch Ophthalmol. 1995 Dec. 113(12):1580-2. [Medline]. Cross SA, Salomao DR, Parisi JE, Kryzer TJ, Bradley EA, Mines JA, et al. Paraneoplastic autoimmune optic neuritis with retinitis defined by CRMP-5-IgG. Ann Neurol. 2003 Jul. 54(1):38-50. [Medline]. Ko AC, Hernández J, Brinton JP, Faidley EA, Mugge SA, Mets MB. Anti-?-enolase autoimmune retinopathy manifesting in early childhood. Arch Ophthalmol. 2010 Dec. 128(12):1590-5. [Medline]. Mohamed Q, Harper CA. Acute optical coherence tomographic findings in cancer-associated retinopathy. Arch Ophthalmol. 2007 Aug. 125(8):1132-3. [Medline]. Abazari A, Allam SS, Adamus G, Ghazi NG. Optical coherence tomography findings in autoimmune retinopathy. Am J Ophthalmol. 2012 Apr. 153(4):750-6, 756.e1. [Medline]. Urner-Bloch U, Urner M, Jaberg-Bentele N, Frauchiger AL, Dummer R, Goldinger SM. MEK inhibitor-associated retinopathy (MEKAR) in metastatic melanoma: Long-term ophthalmic effects. Eur J Cancer. 2016. 65:130-8. [Medline]. Parc CE, Azan E, Bonnel S, Sahel JA, Kaplan J, Thirkill CE. Cone dysfunction as a paraneoplastic syndrome associated with retinal antigens approximating 40 kiloDalton. Ophthalmic Genet. 2006 Jun. 27(2):57-61. [Medline]. Yang S, Dizhoor A, Wilson DJ, Adamus G. GCAP1, Rab6, and HSP27: Novel Autoantibody Targets in Cancer-Associated Retinopathy and Autoimmune Retinopathy. Transl Vis Sci Technol. 2016. 5(3):1. [Medline]. Adamus G, Wilson DJ. The need for standardization of antiretinal antibody detection and measurement. Am J Ophthalmol. 2009 Mar. 147(3):557, author reply 557-8. [Medline]. Eichen JG, Dalmau J, Demopoulos A, Wade D, Posner JB, Rosenfeld MR. The photoreceptor cell-specific nuclear receptor is an autoantigen of paraneoplastic retinopathy. J Neuroophthalmol. 2001 Sep. 21(3):168-72. [Medline]. Maeda T, Maeda A, Maruyama I, Ogawa KI, Kuroki Y, Sahara H, et al. Mechanisms of photoreceptor cell death in cancer-associated retinopathy. Invest Ophthalmol Vis Sci. 2001 Mar. 42(3):705-12. [Medline]. Adamus G, Webb S, Shiraga S, Duvoisin RM. Anti-recoverin antibodies induce an increase in intracellular calcium, leading to apoptosis in retinal cells. J Autoimmun. 2006 Mar. 26(2):146-53. [Medline]. Weinstein JM, Kelman SE, Bresnick GH, Kornguth SE. Paraneoplastic retinopathy associated with antiretinal bipolar cell antibodies in cutaneous malignant melanoma. Ophthalmology. 1994 Jul. 101(7):1236-43. [Medline]. Potter MJ, Adamus G, Szabo SM, Lee R, Mohaseb K, Behn D. Autoantibodies to transducin in a patient with melanoma-associated retinopathy. Am J Ophthalmol. 2002 Jul. 134(1):128-30. [Medline]. Heckenlively JR, Ferreyra HA. Autoimmune retinopathy: a review and summary. Semin Immunopathol. 2008 Apr. 30(2):127-34. [Medline]. Guy J, Aptsiauri N. Treatment of paraneoplastic visual loss with intravenous immunoglobulin: report of 3 cases. Arch Ophthalmol. 1999 Apr. 117(4):471-7. [Medline]. Subhadra C, Dudek AZ, Rath PP, Lee MS. Improvement in visual fields in a patient with melanoma-associated retinopathy treated with intravenous immunoglobulin. J Neuroophthalmol. 2008 Mar. 28(1):23-6. [Medline]. Espandar L, O'Brien S, Thirkill C, Lubecki LA, Esmaeli B. Successful treatment of cancer-associated retinopathy with alemtuzumab. J Neurooncol. 2007 Jul. 83(3):295-302. [Medline]. Mahdi N, Faia LJ, Goodwin J, Nussenblatt RB, Sen HN. A case of autoimmune retinopathy associated with thyroid carcinoma. Ocul Immunol Inflamm. 2010 Aug. 18(4):322-3. [Medline]. Oyama Y, Burt RK, Thirkill C, Hanna E, Merrill K, Keltner J. A case of autoimmune-related retinopathy and optic neuropathy syndrome treated by autologous nonmyeloablative hematopoietic stem cell transplantation. J Neuroophthalmol. 2009 Mar. 29(1):43-9. [Medline]. Ferreyra HA, Jayasundera T, Khan NW, He S, Lu Y, Heckenlively JR. Management of autoimmune retinopathies with immunosuppression. Arch Ophthalmol. 2009 Apr. 127(4):390-7. [Medline]. The authors acknowledge the assistance of Carolee Novak for techinical support.